Remember the sketch I made for this costume? I’m happy to report, I came fairly close. 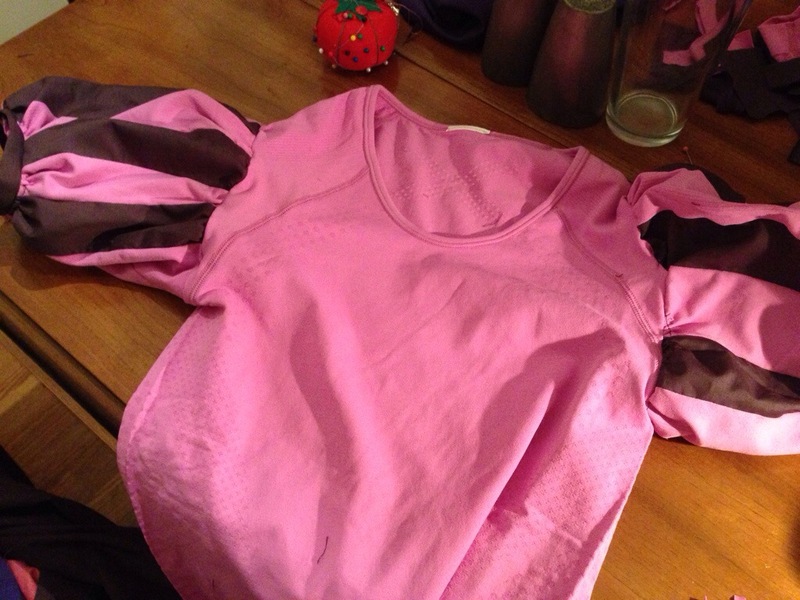 For the top, I started with a base running shirt from 2XU, which I bought solely because the color was perfect. I decided to get the long-sleeved version, just so I’d have some extra material to work with, in case I needed it. 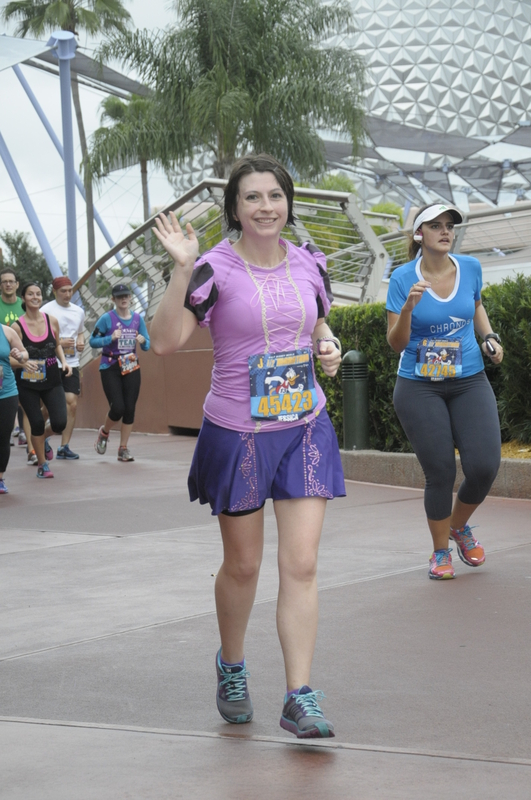 I wasn’t terribly fond of the shirt, other than the color, as it was a little tight for my liking, but it performed well on race day, which is all that really matters. I put the shirt on inside out and marked where I wanted to start the puff sleeves. After removing the shirt, I carefully cut the sleeves off. Then I measured how long I wanted it to be, added a couple inches, and chopped off the sleeve at that point. After that, I ripped out the seam and cut it into four roughly equal pieces. I later discovered that this didn’t make the sleeve poofy enough for my liking, so I did end up using the lower part of the sleeve to cut out two more sections. Glad I bought the long-sleeved shirt! I was feeling broke and lazy, so I rummaged through my scrap box for some pink or purple fabric to use as the sleeve insets. I had about three choices, so I picked the one I liked the looks of with the skirt the best (as for the other choices, one was more hot pink and the other was too blue). I know it’s not the same color as the source photo, but, as I said, I was trying to avoid a trip to the fabric store. I cut out pieces to match the lengths of the already-cut sleeve pieces, then arranged them out how they would be sewn together. 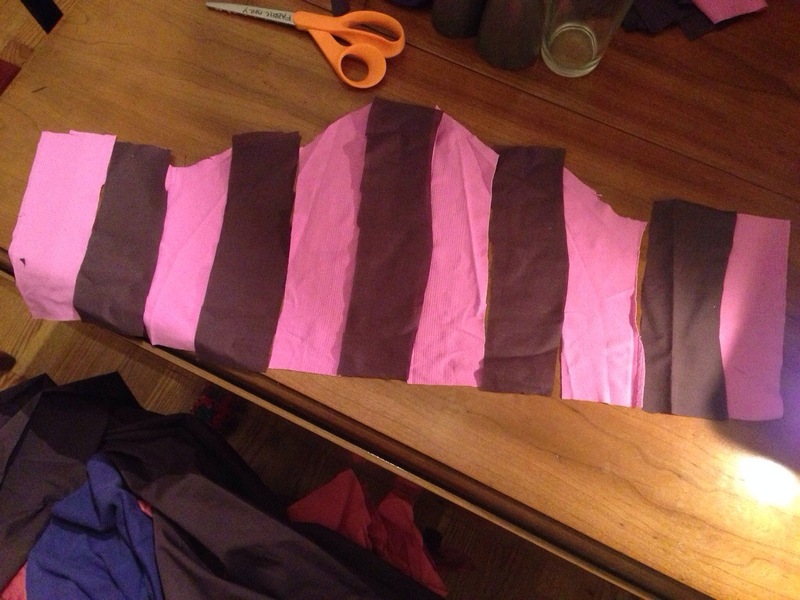 The cut-out material for one sleeve. 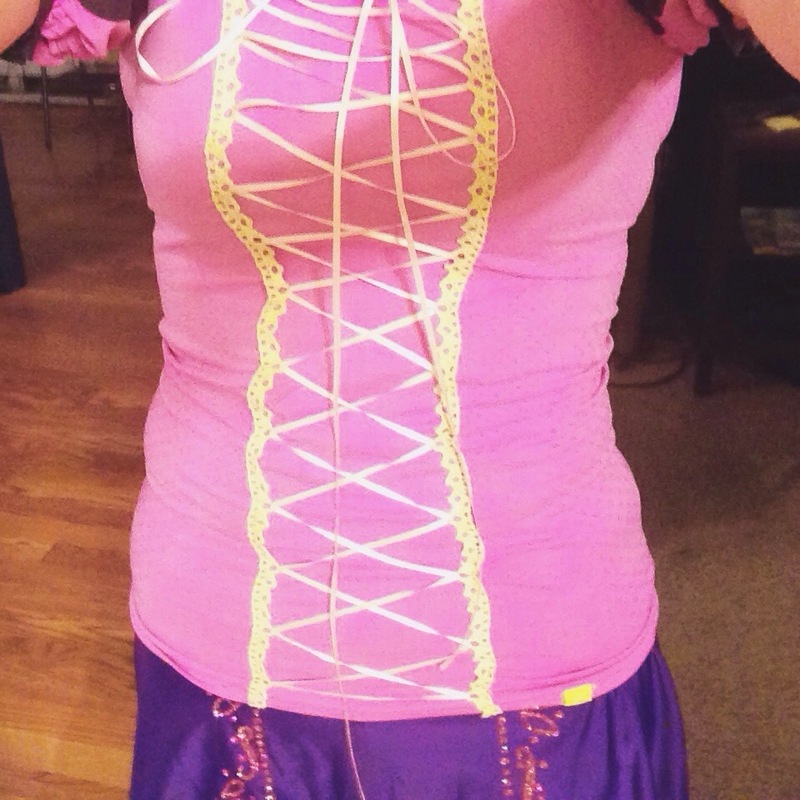 I pinned each piece, right-sides facing, and then sewed them all together. I put in a basting stitch on both the top and bottom hem of the sleeve and used it to gather the material. I measured around my arm where the sleeve would end and cut out a piece of material to act as a band. I sewed it to the bottom hem of the sleeve, then I sewed the sleeve ends together. Sleeves attached to the shirt. Once both sleeves were on there, I had to figure out what to do about the corseted look of the front. I ended up going to the fabric store anyway. 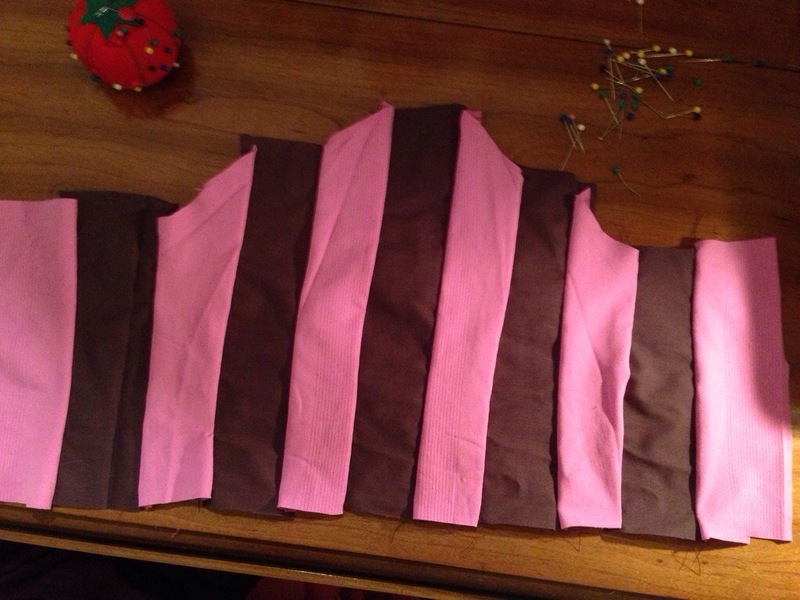 (So I might as well have used the right color fabric on the sleeves. Oh well.) I rummaged through the trim and ribbon aisle until I found some lace stuff that looked like it could double as eyelets. Score! Way easier than actually sewing eyelets. I used the lace trim around the neck of the shirt (since her dress has lace around the collar), and then laboriously hand-stitched the trim down the front of the shirt in two lines. When that was done, I laced the pink ribbon through it. Voila! I trimmed that ribbon down before the race. The skirt was easy. I bought it from SparkleSkirts. I looked all over Disney World for either a Pascal or frying pan pin I could wear, but came up empty handed. I also considered wearing a tiara, but I forgot to buy it. Probably would have been annoying anyway. I did style my hair to look like it had just gotten chopped off (like I literally got a hair cut the day before I left for Disney…at Great Clips, so it would look…rougher), but the humidity took that away from me. This entry was posted in Fun Stuff and tagged costume. Bookmark the permalink. those sleeves are amazing! I haaaate sewing sleeves, especially puff sleeves. Oh, I hate it too! I got all the way through Tangled, The Little Mermaid, Sleeping Beauty, AND Lilo & Stitch before I finished them. Wow! When I first saw your costume I was amazed at how perfect it was for Rapunzel & wondered where you got it – had no clue you made it yourself. Good job! Super jealous of your skills!